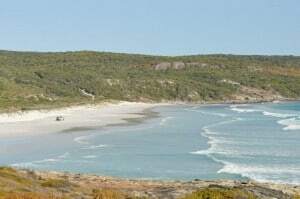 Having packed most of the camping gear away already, we were on the road quickly, headed for Bremer Bay. We decided to camp at a Caravan park rather than on the beach, and had been told the Caravan Park in town was the best to go to. We were given a number of sites to choose from (although not too many; they were still busy!) and then paid our fees. At $36 per night per couple for a powered site you can’t really complain. 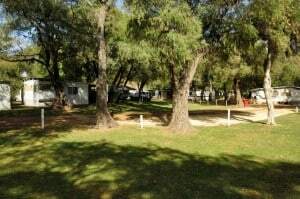 The facilities here are great too; lovely clean grassed areas with plenty of shade, upgraded toilets and showers (which are amazing), a couple of great camp kitchens and the list goes on! We spent about half an hour deciding on which way the tent should face, with Sarah making suggestions and then telling me to ignore her. I gave her a hard time over it, and we were rolling on the floor laughing about the different options. After finally choosing a direction, the tent was up and we had omelets for lunch. We’d been told little boat harbor was great for swimming, so headed out there for a look. The beach was incredible, with little waves rolling in. We had a swim (and I couldn’t resist a quick dive along the dive trail) and sat there enjoying the coastline. 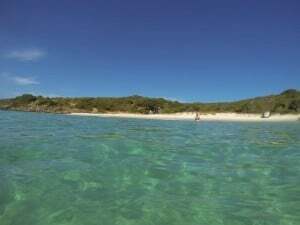 Bremer truly has some incredible beaches, and regardless of where the wind is coming in you can find somewhere protected. I took plenty of photos, and we moved on to explore the rest of the coast. 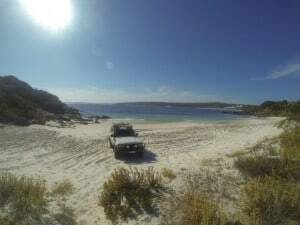 We took the 4WD track to sparkling island, which I thought might be a calm beach with a nice island in the background. After dropping the tyre pressures down and navigating a number of rocky sections, it became apparent we were in for something else! The coast here was tall, rocky and the swell was massive. It’s incredible that you can drive out to a place like this, where you would struggle to fish, dive or swim safely. One has to admire the coastline in WA; one minute you are on a perfectly clear and calm beach, and the next you are looking off a cliff with massive waves smashing against the rocks! 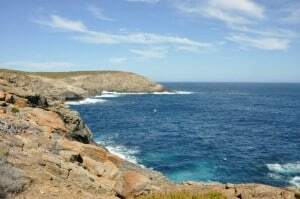 We looked at a number of other beaches and lookouts on the way back to town, and then meandered back to our campsite. We had tacos for dinner, whilst I copied our photos and videos across to the backup hard drive. We went through them too, and were quite impressed with the way some had come out! We woke in the middle of the night to thunder and lightning, and got up to check it out. There were rabbits on the front lawn, kangaroos hopping around and a fox which had dragged our rubbish bag (and someone else’s) out onto the lawn. The fox wasn’t timid at all either; it came right up to where Sarah was standing in the tent to take some bread on the lawn.